President Trump may have taken a page from the Left. Let no crisis go to waste. The caravan is fizzling. But the threat of an invasion headed to the border of the United States made one thing clear. The Obama administration prostituted America’s citizens. Apparently all over the world people believe if they simply gather together in a horde to invade, America will bend over and take it in the tailpipe. A $145 million contract has been awarded to start the construction of a border wall along the U.S. Mexico border in Texas. U.S. Customs and Border Protection and the U.S. Army Corps of Engineers awarded a contract to construct about six miles of levee wall system in the Border Patrol’s Rio Grande Valley sector in Hidalgo County, a CBP news release states. The project is being funded by a share of this year’s appropriations to Customs and Border Protection. The contract was awarded to SLS Co. Ltd. on Wednesday, the release states. Construction is scheduled to begin in February 2019. As we build the wall, Democrats say it will cost billions. As if that’s an untenable amount of money? Illegal immigration costs multiple billions, annually. And look at the cost of preparing for the invasion. While the president says he wants the total funds to build the wall, I say, “Rome was not built in a day”. 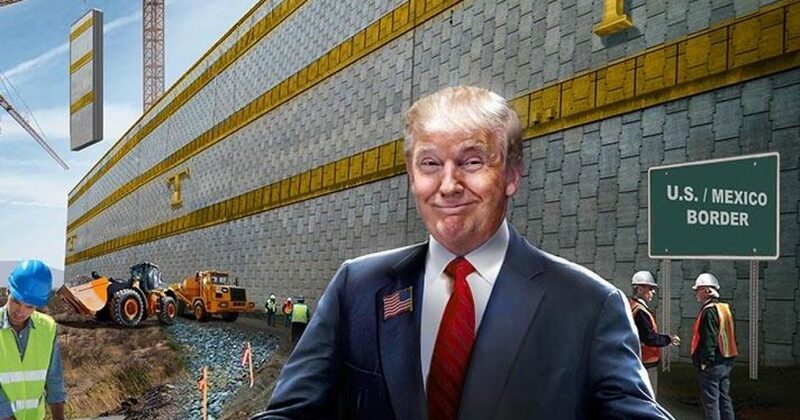 So let’s play the game like the Leftists, and get what we need incrementally, while never backing down on the overall mission: build that wall. $145 million constitutes a rounding error in government spending, so this represents little more than a down-payment financially. However, for the people who voted for Trump, it represents the beginning of another promise kept. Moreover, the beginning of the REAL wall addresses the issue other presidents and legislators have not. Bureaucrats continually kick the can down the road, passing the problem off to the next person. Thus, America accommodates 11-20 million illegals, while annually over a million people wait to legally enter the country. So clearly we have no serious impediment to entering the U.S. by way of Mexico. First however, we must begin with semantics. What exactly is a wall? What President Trump must be clear about is his definition of a wall. Because what Americans want is a relatively impenetrable barrier between us and other countries. Currently Mexico represents the key source of our illegal immigration issues. Nevertheless, a wall could be built in Canada, should their border become a problem.